There are at least two different places you can find the same product in almost every grocery store. 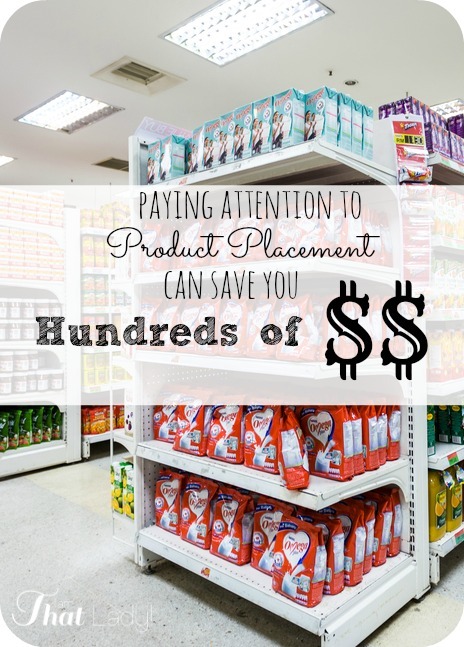 Grocery store product placement can be tricky to figure out, but once you do you will never go to the most ‘obvious' place to find what you are looking for. One of the many ways that grocery stores make money is from product placement throughout their stores. You can often find many of the same items in different places around the store, they usually have different packaging and sometimes VERY different prices. Here is one example with sesame seeds, which Mark and I frequently use for cooking (like our favorite Asian-BBQ Fusion Chicken Recipe). 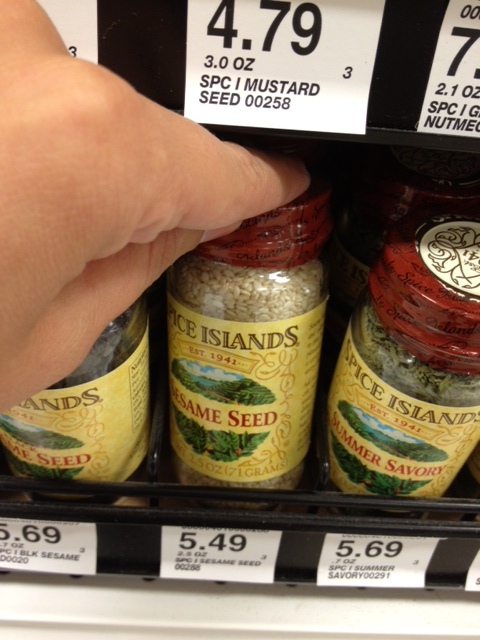 As you can see, you would spend $5.49 on this 2.5 oz container of Spice Island Sesame Seeds in the spice aisle. If you travel just 2 aisles over, you can find a larger 3.75 oz. 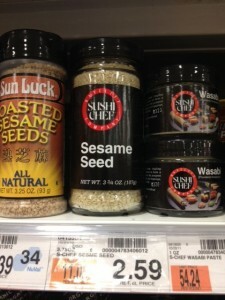 container of sesame seeds in the section for sushi making for only $2.59! You would likely only look for sesame seeds in this aisle if you were making sushi, but for every other purpose of sesame seeds, you would go to the spice aisle and spend $5.49 instead of $2.59. Money Saving Tip: You can also find great deals on spices at the Dollar Store – check out more of the best things to buy at the dollar store. Another example that I found was on almonds. 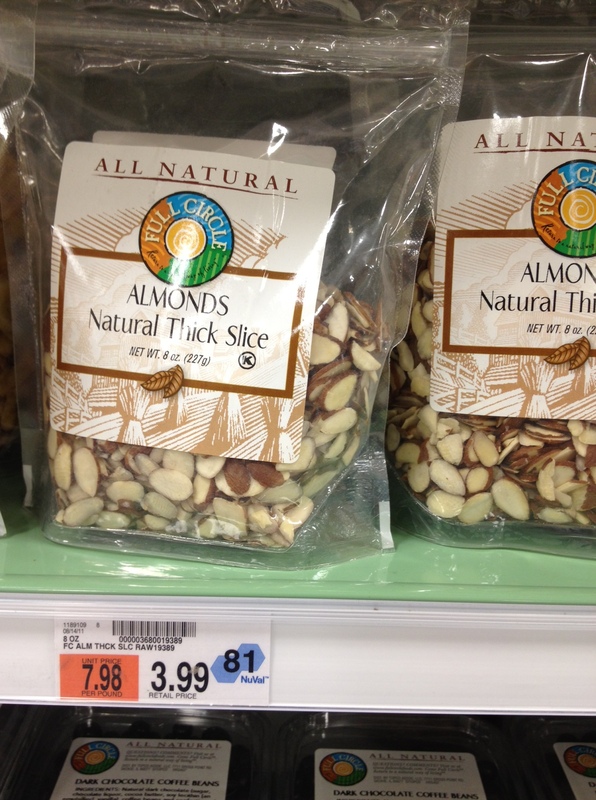 Most people would probably look for these in the baking aisle first, and they would find a 5 oz. 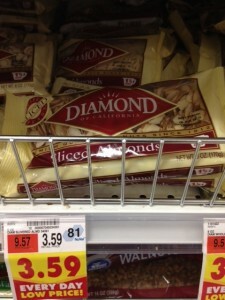 bag of Diamond Almonds for $3.59. In the next aisle over you can find an 8 oz. bag for $3.99 (better price per oz.). 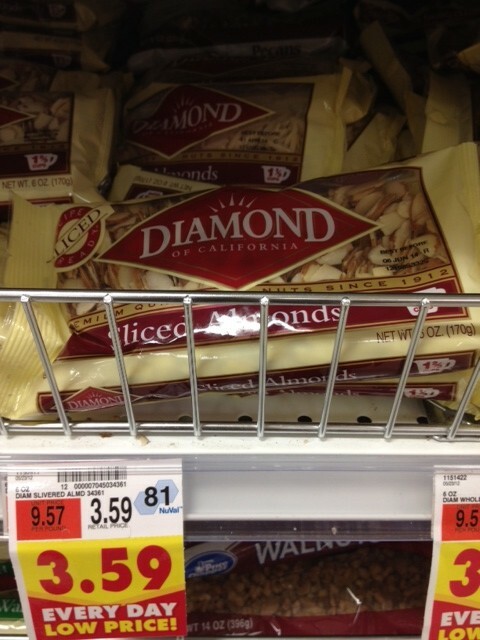 You can also find these even cheaper in the bulk candy section, which would be closer to the $2.99 price point. Some other places with marked up items in the grocery store are travel-sized items. You may sometimes pay 2x's the amount for a travel sized item than you would an item on sale just a foot away from you. Another thing to take note of is where the items is actually placed on the store shelf. The companies on these shelves typically don't have the budget to buy in at the middle shelf space. They set the tone for the store – often calling it giving the store ‘tone and texture'. These items typically set the store apart from their competitors and typically feature more organic and gourmet brands. These best-sellers have to pay to be in this bulls-eye-zone. They typically sell the most and lower valued products will often try to benefit by running a bulls-eye-zone promotion for a while to increase sales. If you think about how tall a child is, you should understanding why kids products are located at their eye level. 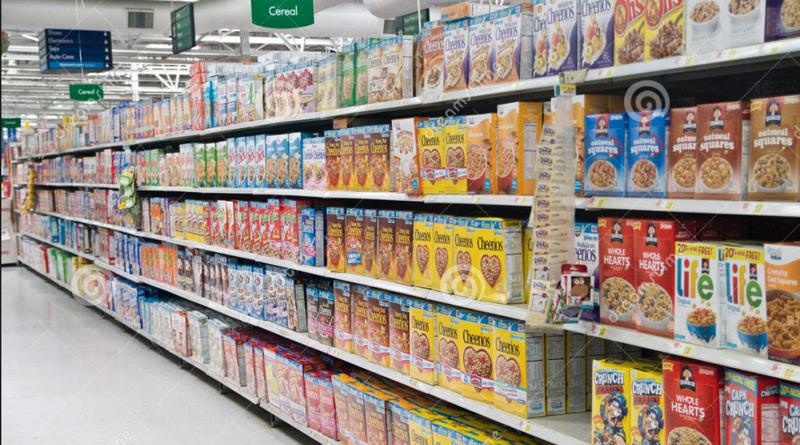 Walk down any grocery store and see where the fruit snacks are, kids cereals, and more kid items. Stores say they don't have to put generic brands on premium shelf space because people are always on the hunt for generic, and will find it on their own. In conclusion, getting a great deal at the grocery store isn't that hard once you know how to navigate there marketing gimmicks. Maybe that is why I love shopping at ALDI so much, because I don't have to worry about the markups and product placement issues. 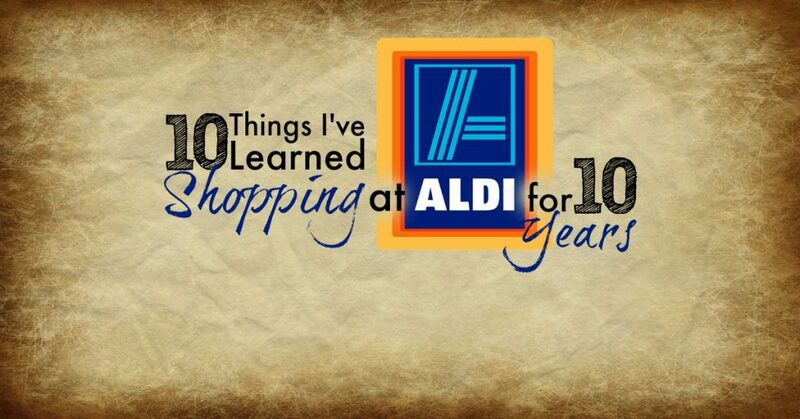 If you've never shopped at ALDI, here are 10 things I learned about ALDI being a 10-year ALDI shopper. What are other areas in the grocery store that you have found to feature the same item in different packaging with different prices? I am planning on using this source for my research project at school (year 12) and I would like to see how credible the information featured on here is. Was any research or interviews with product placement managers conducted or was this article based on solid observation and guesses? I have shopped like that for years, but I don’t think you know what the words “exact same” mean. They are not exactly the same if they are a different brand. And it’s not just label. But, sesame seeds are sesame seeds…the ingredients are the same, right? Wrong. One company might use a local farmer whereas the other ships theirs from another country. One might use fresher seeds than the other. One might be packed in a plant that also packs peanuts. One might have additives the other doesn’t have. And so on.